In all the excitement and public campaigns about the importance of recycling, the other two R’s—reducing and reusing—are often forgotten. Reducing and reusing can be even more significant than recycling in that they eliminate any waste or energy spent in the first place. To that end, a campaign to replace bottled water with water fountains and reusable water bottles was initiated in collaboration with the New York State I Love NY Water Campaign. Laminated signs declaring, “Freefill Stations” were posted on all school water fountains to remind students of the ‘tested, sustainable, and free’ water available to them. 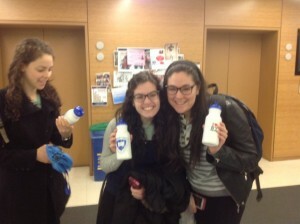 Additionally, reusable water bottles were distributed during Earth Week. The bottles were an enormous hit, with fifty gone in under ten minutes. The student body was quite excited about the bottles. As one student said, “these bottles, together with the signs posted, will really help reduce my water bottle buying habit!” Stickers declaring “I [heart] NY water” were also distributed, with students taking them and sticking them on phones, backpacks, and their new water bottles. Hopefully, the combination of the signs with the sticker and water bottle distribution will help raise awareness of the importance of reducing and reusing, and decrease the amount of waste put out by Yeshiva University students.